Citation: Charles David, M.Arivazhagan, J.Hariram, P.Sruthi. (2016).Spent wash Decolorization using Granular and Powdered Activated Carbon: Taguchi’s Orthogonal Array design and ANN approach . 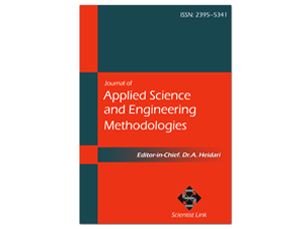 Journal of Applied Science and Engineering Methodologies,Vol.2,No.2,pp.224-229. The intense colour of the spent wash effluent results in the crucial ecological issue when released untreated into the natural water resources. The decolorization of distillery spent wash effluent is a very difficult task. In this study, the performance efficiencies of powdered activated carbon (PAC) and granular activated carbon (GAC) were compared towards the degradation of organic pollutants in terms of colour. The process parameters such as adsorbent dosage, pH, the initial concentration of the effluent and the operating temperature were optimized to attain the maximum decolorization efficiency. Optimization of the process parameters using Taguchi Orthogonal Array (OA) experimental design resulted in a maximum of 95% spent wash decolorization using PAC and 44% using GAC respectively. Using Artificial Neural Network (ANN), a two layered feedforward backpropagation model resulted as the best performance and predictive model for spent wash decolorization. The experimental data was found to be in excellent agreement with the predicted results from the ANN model. Bernardo, E. C.; Egashira, R.; Kawasaki, J. Carbon 1997, 35, 1217. Wedzicha, B. L.; Kaputo, M. T. Food Chem, 1992, 43, 359. Kalavathi, D. F.; Uma, L.; Subramanian, G. Enzyme and microbial technology 2001, 29, 246. Zhou, Y., Liang, Z.; Wand, Y. Desalination 2008, 55, pp. 301. Pant, D.; Adholeya, A. Bioresource Technology 2007, 98, 2321. Nagesh, D.S., Datta, G.L., Prediction of weld bead geometry and penetration in shielded metal-arc welding using artificial neural networks, Journal of Materials Processing Technology, 123 (2002) 303–312. Mohanty, Y.K., Mohanty, B.P., Roy, G.K., Biswal, K.C., Effect of secondary fluidizing medium on hydrodynamics of gas–solid fluidized bed−statistical and ANN approaches, Chem. Eng. J. 148 (2009) 41–49. Wang, J., Wan, W., Experimental design methods for fermentative hydrogen production: a review, Int. J. Hydrogen Energy, 34 (2009) 235–244. Mullai, P., Rene, R.E., A simple multi layered neural network model for predicting bacterial xylanase production by Bacillus sp. using Avena sativa as substrate, Biotechnology, 7 (2008) 499–508. Jasinski, J., Szota, M., Jeziorski, L., Neural networks application for modeling carbonizing process in fluidized bed, Int. Sci. J. 32 (2008) 103–108. Sahoo, A., Roy, G.K., Artificial Neural Network approach to segregation characteristics of binary homogeneous mixtures in promoted gas–solid fluidized beds, Powder Technol. 171 (2007) 54–62. J. Manickaraj, N. Balasubramanian, Estimation of the heat transfer coefficient in a liquid–solid fluidized bed using an artificial neural network, Adv. Powder Technol. (2008) 1–12. Charles David, Arivazhagan, M., Fazaludeen, T., Decolorization of distillery spent wash effluent by electro oxidation (EC and EF) and Fenton processes: A comparative study. Ecotoxicology and Environmental Safety 121 (2015) 142–148. Charles David, Narlawar, R., Arivazhagan, M., Performance Evaluation of Moringa oleifera Seed Extract (MOSE) in Conjunction with Chemical Coagulants for Treating Distillery Spent Wash. Indian Chemical Engineer, Volume 2015, 1–12 pages, http://dx.doi.org/10.1080/00194506.2015.1006147. Charles David, Arivazhagan, M., Balamurali, M.N., Dhivya, S., Decolorization of Distillery Spent Wash Using Biopolymer Synthesized by Pseudomonas aeruginosa Isolated from Tannery Effluent. BioMed Research International, Volume 2015, Article ID 195879, 1–9, http://dx.doi.org/10.1155/2015/ 195879.